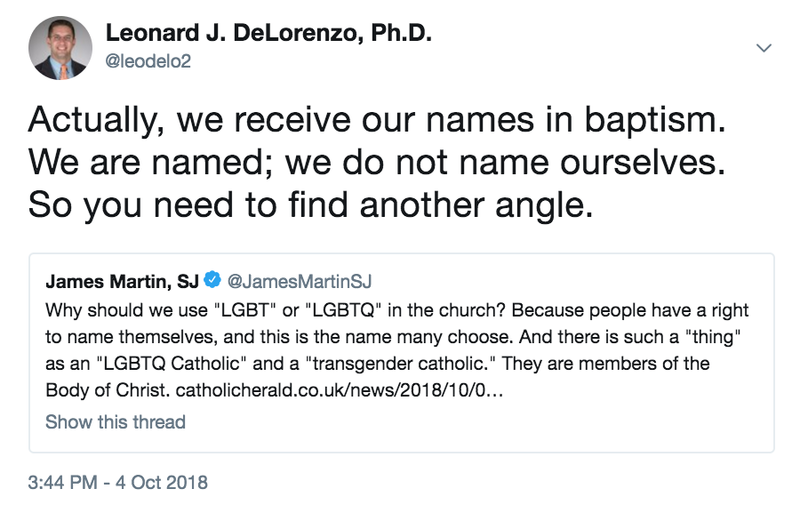 It was reported yesterday that in his address at the meeting of the synod of bishops on “young people”, Archbishop Chaput objected to referring to persons as “LGBTQ Catholics” or “transgender Catholics” or “heterosexual Catholics” in official church documents, thus accepting such designations within the ethos of the Church. Fr. 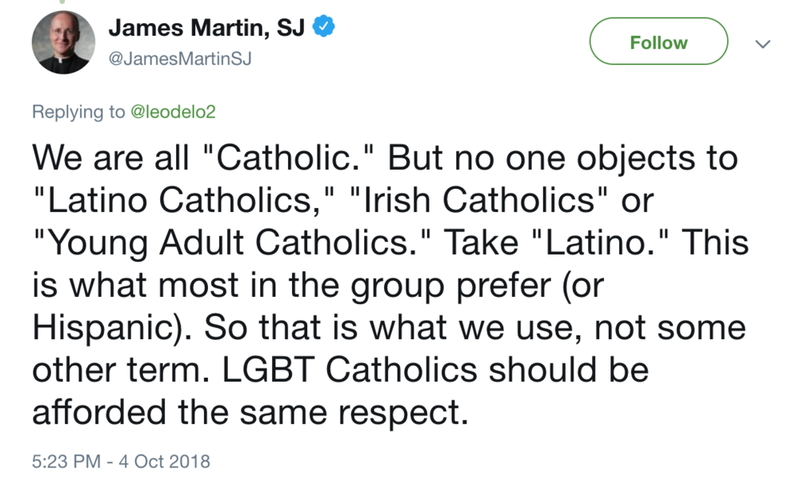 Jim Martin retweeted an article about this statement (which also contains Chaput’s text) and added his own critical response to Archbishop Chaput’s claim, arguing that using these terms is a matter of respect because people have the right to name themselves, including in the Church. Seeing Fr. Martin’s tweet, I retweeted him with a critical remark saying that his (Fr. Martin’s) argument was taking the wrong angle because in baptism our names are given, not selected. I don’t have anywhere near the influence on Twitter or elsewhere that Archbishop Chaput and Fr. Martin have, but my tweet did receive a lot of attention (for me) and even more once Fr. Martin responded to me directly. And it happened fast. Now that we’re all caught up, here’s at least one thing I know: I spoke too quickly and not clearly enough. I cherish slow, deliberate speech—at least in theory if rarely in practice—and my response here was too quick, was not careful enough, and it left open an interpretation that I did not initially intend (and I later even developed that unintended interpretation). When I said that “we receive our names in baptism,” I think the most obvious interpretation is that I mean to stress that we receive the name we go by, what we’re called, how others refer to us at baptism—so it’s unchangeable. What I intended to indicate, however, was that our fundamental Christian identity is bestowed on us—given to us—at baptism and I used “name” to signify that. Obviously, that signification was far too ambiguous without further specification. I initially responded with this intention because I read Archbishop Chaput’s objection as an objection on the grounds of Christian anthropology. I think his claim is that referring to persons as “LGBTQ Catholics” or “transgender Catholics” or “heterosexual Catholics” has significant anthropological implications, whether those consequences are always intended or not. He may be wrong about that, but that’s the claim. And in my reading of the entirety of his brief speech, I think he is saying that our identities as Christians is fundamentally given, not self-selected. In his brief Twitter response (brief by necessity because: Twitter), Fr. Martin argued for the legitimacy of self-identification, principally as a matter of respect for self-determination. There may indeed be legitimacy to that argument, but I don’t think it actually addresses what Archbishop Chaput is saying. I responded—too quickly—by citing the giving of a name at baptism to point to what I thought was central to Chaput’s claim and therefore what Martin was missing. Fr. Martin is a champion of fostering respect and establishing civility, both inside and outside the Church. I take to heart what he said in response to me about respect in terms of how we address each other. But I don’t think that is a response in-kind to what Archbishop Chaput was claiming. I understand Archbishop Chaput to be objecting to what he sees as the popular idea that we are the identities we choose; on that point, he is arguing that the belief that our identities are not just constructed but also chosen is not Christian. In that sense, it is likely to the “T” in “LGBTQ” that he is most strongly objecting, as inconsistent with Christian anthropology. It’s not a tepid objection, that’s for sure. I want to suggest that Archbishop Chaput’s actual claim deserves a response, and Fr. Martin is the one to do it. When I too quickly tweeted “you need to find another angle,” this is what I intended: I want Fr. Martin to respond to the actual claim, with all the significance attached to it. This isn’t to say that how Fr. Martin did respond is not significant, but rather that I didn’t think he was addressing the actual point. Accept Archbishop Chaput’s insistence on the givenness of Christian identity, but argue that the acceptance of the cultural terms to which he is objecting and therefore their incorporation into church documents does not, in fact, bear fundamental anthropological consequences, whether intended or unintended. Accept Archbishop Chaput’s view as a “traditional” way of understanding fundamental Christian identity, but argue that this way needs to be reinterpreted and revised. Reject Archbishop Chaput’s implicit assumption that Christian identity is a matter of what is given rather than selected or constructed and thus reject the idea that the identity given to Christians (as I have suggested, through our baptism) is the basis of who each and all of us are as Christians. Short of responding to Archbishop Chaput on terms like these, I think it is fair to say that the response that Fr. Martin has already given appears common to his general approach. In fact, it was critiqued by R.J. Snell in this review of Martin’s book. In the middle of the review, you will see Snell treating the very same argument that Fr. Martin employed yesterday, which has to do with the call for respect in calling others what they want to be called. I’m still not completely happy with how I’m saying what I’m saying here, but at least I’ve taken some more time to think about it than I did in my initial, somewhat impulsive, totally Twitterish intervention. If Fr. Martin or any others who responded critically to my initial intervention happen to read this, I really do hope he and you will receive a sense of my respect along with my words, because I definitely do intend that.